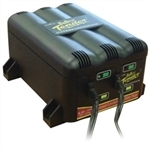 On this section of our website you can browse through our selection of 12 Volt Battery Chargers. 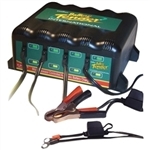 This is a 12 Volt 0.5 Amp battery charger with Alligator Clip connector. This is a 12 Volt 6 Amp battery charger with AC connector. This is a 12 Volt 2 Amp battery charger with Alligator Clip connector. This is a 022-0165-DL-WH battery charger with connector. This is a 022-0148-DL-WH battery charger with connector.